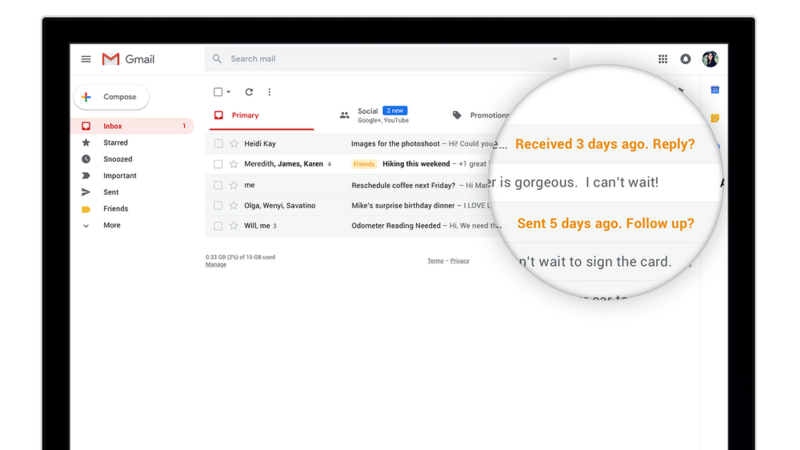 We launched the new Gmail earlier this year and packed it with features to help you prioritize and accomplish things right from your inbox. And it’s a good thing too, because it’s estimated that we send and receive more than 100 emails a day. With this volume, it can be tough to stay focused on what matters. Here are five ways the new Gmail can help you save time and get more done. 1. You can prioritize emails more easily. How many times have you read an email and forgotten to respond? It’s easy to do. To help you remember, Gmail will “nudge” you to follow up or reply to messages by sharing a quick reminder next to the email. Powered by machine learning, it uses cues like frequent contacts and more to remind you to respond to stuff that’s higher priority. Or if you have an email that you can’t get to right away, you can “Snooze” and choose how long before you see the message again. 2. You can write and reply to emails faster. Sometimes it’s tough to put pen to, err … keyboard. So we’ve incorporated a new machine learning-powered feature in Gmail called Smart Compose, which suggests phrases to help you complete sentences in your emails so that you can draft them quicker. And if you want to reply to emails quicker, you can use Smart Reply, which suggests responses at the bottom of a message—great for dealing with emails on the go. 3. You can work offline. No internet access but have a lot to get done? We’ve got you covered. Enable Gmail’s offline mode to load, read, respond to and search your conversations even when you aren't connected to the internet. Simply type in “mail.google.com” in Chrome and you’re good to go. 4. You can get stuff done without leaving your inbox. The new Gmail gives you quick access to apps you use often, like Google Calendar, Keep and Tasks without leaving your inbox. You can even find more Add-ons to download and customize your inbox. One fun one to check out is the Gyfcat Add-on, because sometimes this is the only appropriate way to end an email. 5. It helps you keep your information safe. Ever accidentally clicked into a sketchy email? Gmail helps you avoid spammers by proactively warning you when something looks phish-y. 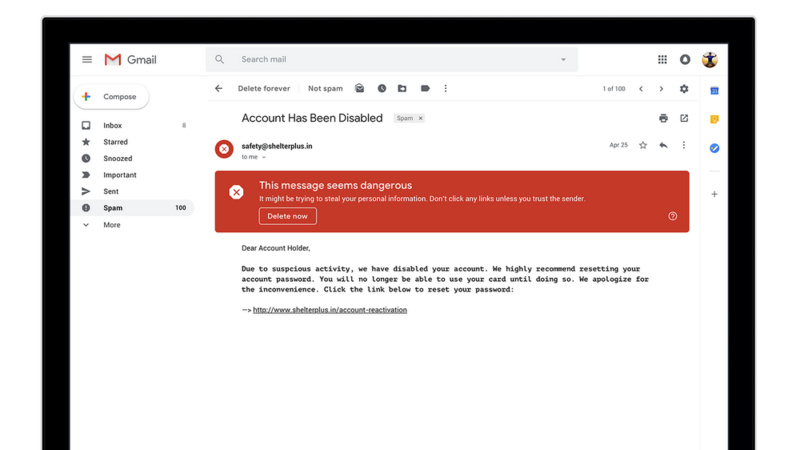 If you try to click into a potential spam or phishing message, you’ll get a big, red alert that tells you it looks dangerous. The new Gmail, now available for everyone, is smarter and easier to use so your inbox can help you do more at home or at work. Looking for more? Check out this hidden gem for tips on how to stay even more productive at the workplace.